Early looks at Apple's gargantuan new tablet have begun to trickle in, with most reviewers coming to relatively similar conclusions: the iPad Pro is an excellent machine and the best iPad yet, but iOS means it won't be a laptop replacement anytime soon. Perhaps the most pro-iPad technology journalist in the world, Walt Mossberg is high on the iPad Pro's abilities for creative professionals. He is "blown away by the Apple Pencil," and praised the iPad Pro's excellent battery life. He won't be using the iPad Pro to replace a Mac laptop any time soon, though, largely thanks to the subpar keyboard, which he panned for its lack of iPad-specific shortcut keys and backlighting. 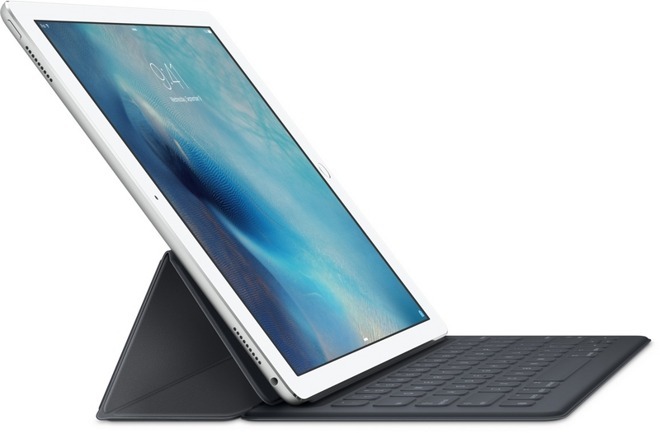 Mossberg does believe that the iPad Pro works better as a productivity tablet than Microsoft's Surface, however, thanks to the wider availability of iPad-optimized apps. David Pierce of Wired found the iPad Pro's performance to be excellent, ditto its display. He likewise enjoyed the Apple Pencil, but found that the Smart Keyboard didn't add much and echoed other reviewers' lament at the lack of shortcut buttons. Pierce believes the touch-first design of iOS detracts from the operating system's ability to adapt to different workflows —and thus allow the iPad Pro to act as a laptop replacement —and he wants for a mouse in some circumstances. Still, he says, the next generation of consumers for whom a smartphone is their computer may find a more natural progression to the iPad Pro. Ars Technica's Andrew Cunningham also loved the iPad Pro's performance and praised the upgraded speakers. The Pencil is seen as an excellent addition, though he winced at the total price tag when Pencil and Smart Keyboard are included. The lack of iOS 9 multitasking support among many apps is a drawback, as is the limited nature of multitasking in and of itself. Cunningham also wished for an easier way to store the Pencil with the iPad Pro.